Nothing says "Good Morning!" on a dreary winter day quite as cheerfully as freshly baked, still warm, Glazed Meyer Lemon and Blueberry Cream Scones. Meyer lemons, prized for their sweet-tart flavor and deep yellow, thin rinds, add brightness to otherwise ho-hum cream scones. And just because it's winter time, doesn't mean you shouldn't enjoy blueberries. Unthawed frozen blueberries (or raspberries) work beautifully in baked goods, like these scones. Be careful though -- once you take a bite, you may get fooled into thinking summer is just around the corner. Note: If you can't find Meyer lemons, then substitute regular lemons. 1. Preheat oven to 425 degrees. Place oven racks in top and bottom thirds of the oven. Line two large baking sheets with parchment paper. 2. Combine flour, sugar, baking powder, and salt in a large bowl and stir. 3. Cut the butter into small pieces, and add to the flour mixture. Mix with a pastry blender or fork, until a coarse meal forms with tiny pea-sized butter pieces. 4. Whisk eggs and heavy cream in a small bowl. Stir in zest and juice. Add to the flour and butter mixture. Begin to gently mix with a spatula. Add the blueberries. Mix until just combined. (It's OK if a few berries bleed.) Do not over mix, or the dough will become leaden. 5. Using a floured surface, shape the dough into 1 large or 2 small disks, about 1/2-inch thick. With a wet knife (to make slicing easier) cut the dough into triangular shaped scones. Place scones on parchment paper-lined baking sheets. Brush scones with egg wash.
7. Bake scones for 15 minutes, rotating pans mid-way through, or until puffed and golden; transfer to a rack to cool. Cool completely before glazing. 8. For the glaze: Whisk all ingredients in a small bowl until smooth. The glaze should cling to the back of a spoon. 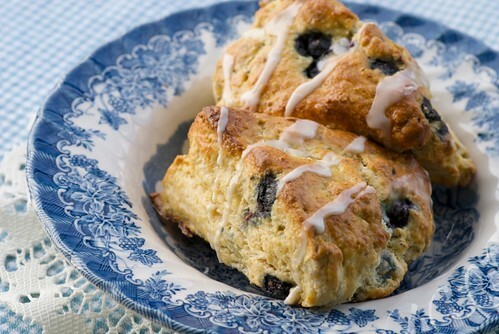 For easy clean up, place a sheet of parchment paper underneath the wire rack before glazing the scones. Drizzle glaze over scones. Cool completely until the glaze hardens. A great way to start the day! Susan-these look heavenly. Lemon and blueberry are my favorite and I am sure the cream adds the perfect amount of sweetness! That IS a good way to start any morning. I'm sure the zing of the Meyer lemon is a way to wake up the tastebuds. Meyer lemons aren't all that easy to come by here in Rhode Island, or when you can find them, they're expensive. However, on my last trip to Costco I found a box of 12 Meyer lemons at an affordable price. My husband made a few batches of lemon curd, and we stored leftover lemons in the fridge for a few days before making a salmon glaze with them. Next batch goes to these scones -- they look delicious. Well hello! The scones, the old world plates, love it all. What time is tea, m'lady? I'd like to wake up to those! These scones look fantastic! a. I love scones, b. lemon and blueberry are also good friends of mine, c. these are perfect. Those are pieces of heaven! O how I love them. I would like them with my afternoon coffee too. Gorgeous! Scones are my favorite baked breakfast food, and the thought of blueberries has me longing for some. rosa-I can tell you it really is! sean-Snowing in GA? Good grief. lydia-I have had "make lemon curd" on my list of things to do for over a year now! I've got to do it. I love it. lisa-Then these babies are for you. soma-Ah, yes, the perfect afternoon snack. andrea-It's easy to long for baked goods with blueberries, isn't it? Hey, haven't been around for a while... life got so busy that can't even find time to check my favourite blogs :( How are you doing Susan? I've got the lemons, maybe I'll make a blueberry tun. I think the combination of lemon and blueberry is fantastic. I have use them in muffins, but never in scones. I want to try this out! I love making something like this when someone comes to visit--looks so pretty on your blue plate! Hi Susan, How do I make these healthy? can I simply substitute whole wheat for all purpose flour? Why thawed blueberries- aren't they mushy?? Would you drain them first? margot-It's great to hear from you too. Thanks for the heads up. :) A croissant and yogurt sounds lovely to me. teachercooks-Then you'll love these scones. tastyeatsathome-I'm spoiled because they're grown here in CA. Although most Trader Joe's sell them if you have one near you. cookingisfun-I would suggest half all-purpose and half wheat. Lemon and blueberry is a favorite combination of mine. These look delicious! I still don't think I've tried meyer lemon yet...and these look simply divine! I'll have to keep my eyes out at the store to see if I can scoop some up! I made these scones over the weekend, baked half of the batch right away and put the other pre-cut, egg washed scone dough in the freezer. I just baked the frozen scones this morning with the same remarkable results - these are phenomenal scones! Freezing the raw dough makes it easy to have freshly baked scones with little effort anytime! Bake @ 375 for 25-30 minutes. Thanks for another dynamite recipe!